There are two important Unesco World Heritage Site in Hiroshima, the Hiroshima Peace Memorial or “Genbaku Dome”/”Atomic Bomb Dome”, the ruins of the building left after the atomic bombing in 1945. The other Unesco site is Miyajima, the floating Shrine. So Hiroshima is also an important city to visit in Japan. Why we choose Hiroshima Airport? We choose to land in Hiroshima Airport rather than Kansai Airport because the air ticket flying from Singapore to Hiroshima Airport is cheaper. The second reason was Hiroshima Airport has fewer crowds of tourists as compare to Kansai Airport. Well, if you are doing a self-driving with a rental car, it is preferable to use Hiroshima Airport as it has fewer people and fewer cars, easier for you to navigate your way out from the airport. The way out the airport is very “inaka”/countryside and really not many cars at all. During our last two days in Hiroshima-Kansai-Shikoku self-drive road trip, we stayed in Hiroshima Airport Hotel. One thing good about Hiroshima Airport Hotel, it is located very near to Hiroshima Airport. You can walk to the airport if you do not have very big luggage with you. There are also free shuttle buses to bring to the airport. We have our rental car, so we returned our return car near the airport and the rental car arrange their shuttle bus to drive us to Hiroshima Airport. Hiroshima Airport Hotel, rental cars agents and the Airport are all located nearby. Even if you have a very early morning flight to catch, you are still able to make it. Our flight back home is at around 10 am and we need to check in at the airport at 8 am. We check out from our hotel at around 7 am and returned our rental car to the rental car company at around 7 plus am. The rental car agent open at 7 am. It took less than 10 mins to return the car to the rental agent and immediately drove us to the airport with their shuttle bus. The room in Hiroshima Airport Hotel is western style, do not expect if there is public “onsen” or hot spring bath. Each hotel room has its own toilet and bathroom. The thing I like about Hiroshima Airport Hotel is the room is very spacious as compared to the Japanese standard. I guess the reason is pretty obvious, the hotel is not located in the city center hence we could enjoy a bigger space. In Japan, hotel rates are by the number of people in the room. You cannot lie and tell them 2 pax staying and then sneak in an extra pax. It is not per room but per head. Sometimes you got to stay in a very large family room but still paying for 3 pax price. It has all the basic toiletries and clean towels. There is a Japanese bathtub (smaller version as compared to western version but deeper) and an advanced Japanese toilet seat which has the control panel at the side to adjust the water spray for bidet wash and seat warmer. There are two restaurants at the hotel, one western and one Japanese. We choose a Japanese restaurant. They have this special menu set offer valid to their guests who stayed in the hotel only. The course of the Japanese meal cost only at 2,000 yen (USD18.00). This special offer is not valid for guests who do not stay in the hotel. The value meal set contains sukiyaki beef & tofu with half raw egg, Korokke (deep-fried dish), sashimi, tsumami (small dish or appetizer), egg roll, miso soup, daikon radish pickles, and rice. This is another value set but offer to outside guest too. The selling point for this meal set is the Turban Shell (Sazae) and their sake alcohol. The way it was cooked is by grilling on the bbq with a sprinkle of salts. The meat is very chewy. It can be a bit bitter when you first bite it. Momiji is maple leaves in Japanese, it is a famous dessert or type of “manju” in Hiroshima, especially in Miyajima Island. There are some “yakimono” or Japanese handmade ceramic on sales in the hotel. Yakimono literally translates as fire thing -yaki is fire and mono is thing, it is an important ceramic culture of Japan. Different region in Japan has a different style and color of the ceramic making. The breakfast spread is good, it has both western and Japanese choice. Traditional Japanese breakfast usually contains a small piece of grilled fish, rice, miso soup, egg, nori, and Japanese pickles. Umeboshi or Japanese red salt plums is a must try pickles in Japan. Be prepared when you bite this pickles! You should try the Japanese “wafu” dressing when eating salad in Japan. It has vinaigrette-type, contains of Japanese soy sauce, rice vinegar, mirin and vegetable oil. Very appetizing. Cold Area for tofu, yogurt, natto & cold soba noodles. Outdoor Sitting near the breakfast area. Autumn view from the hotel. There are free shuttle buses to send you to the airport and free parking for rental cars outside the hotel. There is a small petrol station nearby but their office closes at around 7 pm. After office hours, you are still able to pump petrol and use the kiosk machine to pay. If you have a rental car, please remember to fill up the petrol tank before returning. It is best to do it the night before you fly back home. 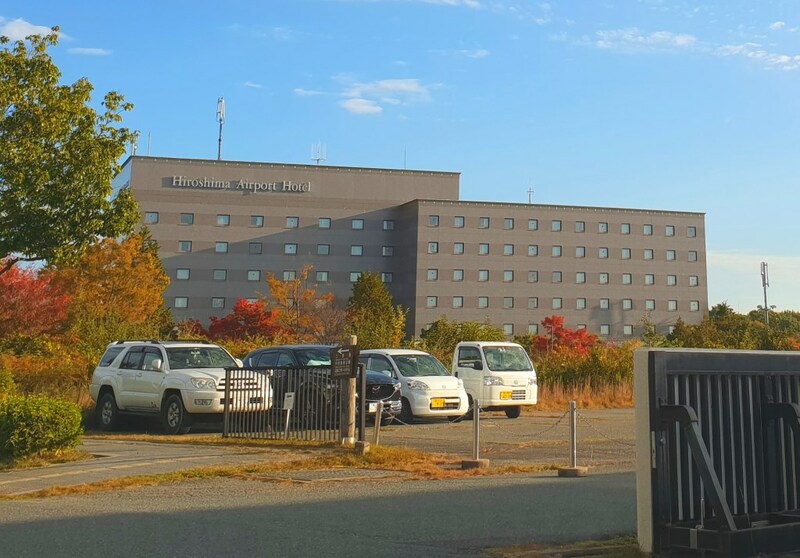 Hiroshima Airport hotel is located in Mihara Hiroshima and it is about 53 km away from the city. It is good for guests who have their own rental cars because it is still very convenient to drive to the city and other top attractions. We stay in Hiroshima Airport Hotel for 2 nights. If you are in transit or need to catch an early morning flight, this hotel is ideal. You may want to check out a beautiful Japanese park called Sankeien Garden, within walking distance 5-10 mins if you have extra time to spend. If you do not want to dine the hotel, you may want to go to the Airport as there are several restaurants and convenience stores too. I can’t get over how beautiful the views are there. The autumn colors of the trees are stunning. And the rooms, my goodness, they are room, cozy looking and just beautiful. I’d love to stay at this hotel sometime. The room in the Hiroshima Airport hotel is built in the western style, there are beds instead of Japanese futon beds and the room is very spacious. This looks like a wonderful hotel to stay at! I am all about the food. It looks fabulous. I’ll keep this hotel in mind if I’m in Japan! The dinner in the restaurant is very high quality and not too expensive. They do offer a budget meal for their guests and it only cost 2000 yen, (less than USD 20) to taste a good authentic Japanese meals which have quite a variety of stuff. Wow that looks like a stunning place to stay. All the food looks delish! Beautiful views! You did a great job explaining the various types of foods. There are so many to choose from, it looks like a great spread. I am quite happy with both dinner and breakfast. The breakfast spread is good and has both western and Japanese choice to choose from. The view in the morning when we have our breakfast is stunning, as autumn colors started to kick in. This looks like a nice hotel to stay in before or after a flight. I can’t believe how beautiful the views are out of it, considering it is near an airport. You are right, this hotel is ideal for people who need to catch the morning flight, it is convenient as you can literally walk over to the airport to check in. Anyway, the hotel also offers free shuttle bus services. omg the hotel, the views, the food, everything!!! I died! The place looks amazinggggg…Hiroshima soonnnnnn. The hotel does not look too fancy from the outside but you will be quite surprised with the garden view and mountain behind the hotel. Really a hidden gem. The accommodations look very comfortable. We hosted a Japanese student and hope to see her again on our visit to Japan. We are thinking of going in 2020, which is also the year that they host the Olympics! Wow, glad that you have a Japanese student in your home and I am sure it is a very interesting exchange experience. 2020 Olympic in Japan will be an exciting year for both tourists and local Japanese. Ahh, Japan is definitely on my bucket list! I especially can’t wait to try their amazing food! Every time I visited Japan, I am always looking forward to their local food. It is cheap and delicious, I am not sure why over here in my country, it cost so expensive to have Japanese food and it does not taste as authentic. Even the ready-made bento set in the Japanese convenience store tasted so awesome. This looks like an amazing place to stay! That autumn view is to die for! I like the minimalist room style as well. One of the best season to visit Japan is in autumn and spring. In autumn you get to see “koyo” or leaves turn yellow and red. In springs, you got to see pink and white sakura cherry blossom everywhere. Glad that the hotel has a so beautiful and surrounded by beautiful garden and mountains. I do love the japanese food and I am amazed about how innovative their toilet seats with their fancy buttons and bidet. We did enjoy our vacation there. You are right, the toilet seat in Japan is brilliant, you only need a finger to operate. Even opening the toilet seat cover, you don’t have to worry to get your hand dirty. oh my god! food heaven. a great review ! i hope to go there someday. Everything looks great. My favorite thing? Oh my goodness that food! It looks like a pretty nice place to stay! I’ve never been to this area! Lovely outdoor view, beautiful trees and garden. WOuld love to go here someday. Looks beautiful I can’t wait to travel international. The food looks delicious! That beverage machine looks like it has sooo many options!